Charlie Hustle did something incredibly difficult: they created a t-shirt that became the symbol of a city. Specifically, Kansas City. The shirt with a simple KC heart design went viral when the Royals won the World Series in 2014, but the brand hasn’t slowed down since. 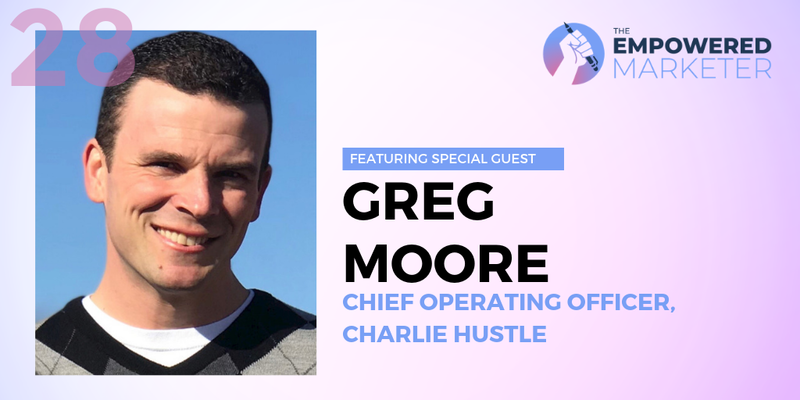 Greg Moore, the Chief Operating Officer at Charlie Hustle, explained that one mega success is not enough for a sustainable business. So today, the vintage-style sports clothing brand puts out a new product every two weeks, expanding into college gear, exclusive licensing deals with pro athletes like Patrick Mahomes, and much more. And Greg is there helping the brand grow and scale. A former journalist who made the switch over to ecommerce, he previously worked for Pro Athlete, a huge distributor of baseball bats and gloves, where he managed their marketing and merchandising before moving into his role as COO at Charlie Hustle. 1. How often do you put out new products and decide to go after a new school or a new sport? For example, the Patrick Mahomes Showtime tee is obviously very timely. How do you decide what new shirt to put out? That’s the hard part. Making T-shirts, you have to be adaptable. Patrick Mahomes is a great example. He took the NFL world by storm, really, since September. There were a lot of apparel companies, not only here in Kansas City, but nationally, using his likeness or using his name — and that’s illegal. We did it the right way. We’re the only officially licensed T-shirt company making shirts with a deal with Patrick. That’s allowed us to grow that brand because he knows that we can be trusted. And obviously, he’s making money for every shirt that we sell from him. Basically, we try to be very strategic with our partnerships. We would love to know when something’s coming in three months. But Patrick Mahomes or other things that we have in the works are so dependent on team success; so dependent on player success; so dependent on what’s really organic at the time. That said, we do try to release a new product once every two weeks. We see it as an opportunity to keep everything fresh, get something else out there in the marketplace, and get people talking. The hope is they see something like a new Patrick Mahomes T-shirt or something about Kansas City playoffs, and it’s a reminder: Okay, here is Charlie Hustle. They might see something they like on our site or at the store they like. 2. Because it’s such a niche product and you’re serving these very specific sports fans, how do you reach that audience? How do you figure out who’s actually a fan and who might want that Patrick Mahomes shirt? Charlie Hustle probably has the one thing that’s impossible for a company to have, which is this cool factor; this organic growth. Anything we release has a built-in group of influencers that can help us out. We became very popular back in 2013, 2014, because Paul Rudd said this was his very favorite T-shirt. He said that in a national interview, and then Jason Sudeikis all of a sudden was wearing one of our shirts too. Our email marketing is also very strong. We get 30% of our online traffic from email marketing, though we try not to inundate people with too many messages. We send out about two to three emails a day that are segmented. Then, social media’s huge for us. Like everyone else, we do Facebook ads, but even the organic posts do very well for us. We like to think that because we’re not annoying people three times a day, we get a better response. We try to stay top of mind. Here’s something inspirational. Here’s a new product release. Here’s something new tied to the Kansas City Chiefs playoff run, or something like that. It’s been very effective for us for a long time. 3. What about customer loyalty? How do you get people to come back, and buy your new products? How do you incentivize buyers to buy again and continue to engage with them over time? I think customer loyalty is something every company struggles with. We are very fortunate that 67% of our online traffic last year was returning customers. We have a very strong brand, especially in Kansas City, and when people buy one of our T-shirts, they’re invested. We don’t have a hard time getting returning customers back. However, we launched a loyalty rewards program early last year, and it did very well. It attracted people, but then the engagement stopped. At the end of the day, we weren’t providing value. We revamped everything in November and we’re looking to revamp it even more in 2019. We had to ask, “Okay, people sign up because they get X amount off their next order. Are they just doing it for the discount, or are they really loyal to Charlie Hustle?” Based on the statistics, we saw they’re just signing up to get that 15% off their next order. We need to do better at providing value with our customer loyalty program. We want the people that are signed up for our loyalty rewards program to get better opportunities to maybe be in the front row of events or ensure that they have a ticket to a big game. Those are the types of things that are going to make our customer loyalty program really, really strong. Right now, we have those returning customers. We need to treat them like they’re family. We never want to lose them. We want to give them the best experience ever. We want them to go out there and say, “Hey, best friend, guess what? Charlie Hustle got me a chance to meet Paul Rudd just because I’m a supporter.” That’s what we want. To learn more about Greg Moore and Charlie Hustle, go to www.charliehustle.com for more info.